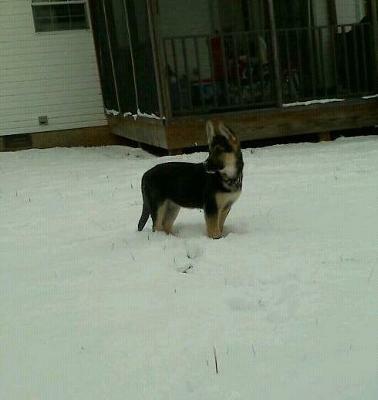 For Christmas I got a German Shepherd puppy. Her name is Jazzie Rhae; she's 11 weeks and 20 pounds. A couple days before my mother's jack russell had puppies. They are now walking around everywhere! Jazzie watches them and makes sure they dont wonder off when mommy isnt around. She is so smart! She has learned to sit and lay down. She is working on shake and roll over. She is great on leash but she still has trouble sometimes with potting (but thats my fault I am in school 8 hours a day). She loves to fetch and she loves the snow!! I have put pictures of her and the puppies, and some of her in the snow. 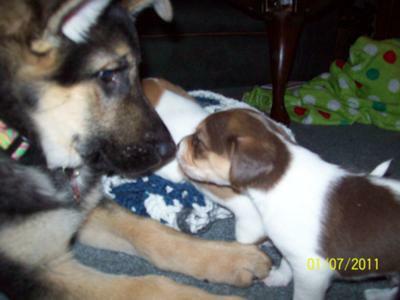 Comments for My German Shepherd Puppy Babysits Our Jack Russell Puppies.. I imagine that you must have a lot of patience. You'd have to have it to live with all those little rascals running around - goof luck, have fun and keep that patience up. This is so cute. What a nice little story and so good to hear that they are getting along together well even though they are 2 different breeds and 2 different sizes. And the pictures are so good. So how did things go on as the Jack Russell Puppies grew up and got more active - how did the German Shepherd Puppy do since it is still a baby too? I imagine it had so much fun with these new little playmates. 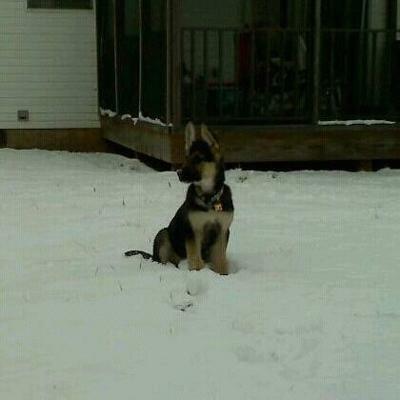 Thanks so much for sharing your German Shepherd Puppy story and pictures here. And the Jack Russell Puppies have proven to be so sweet I'll bet too but I know they can be quite a handful too. So good luck with all those puppies - German Shepherd and Jack Russell - they will certainly get you some good exercise!